The cultivator removes the weeds between rows of crops. Cultivators can have straight or curved 'teeth', spring 'teeth', or disks. The 'teeth' - also called 'spikes' or 'tines' -- can be adjusted to dig into the soil at the same depth. This surry (riding) cultivator was common in the 1890's and replaced smaller cultivators. The springs allow the tines to bounce off rocks or large clumps of dirt without damage. It is drawn by 2 horses. By the 1930's gasoline tractors replace most of the horse drawn equipment. The removal of weeds between the plants was necessary for many reasons. The weeds took water and nutrients from the crop. The weeds also might contaminate the crop at harvest. A cultivator removes the weeds between the rows of crops. Prior to 1800's this was usually with done by hand with a hoe. 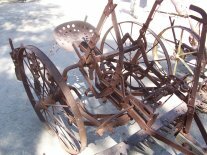 By the 1850's hundred of different types of horse drawn cultivators were made. Cultivators have straight or curved tines, spring tines or disks. By the 1890's larger cultivators with seats were available. Gradually, the disk cultivator replaced all of the spike cultivators as it was could be pulled faster with motorized equipment. This surrey cultivator pictured has adjustable spring loaded curved tines. The location of the tines is set by where they are bolted onto the tine arms. The tines individual height can de adjusted for wear so their tips are all at the same level. The tine arms are adjustable for proper spacing between the rows. They can be adjusted by pulling the center L shaped handle while pushing on the pedals. The arms are also spring loaded, and the left spring is still intact. All the springs allow for a tine to hit and bounce off of large clumps of dirt without moving the other tines too much. The arms can be raised and lowered by the handles on either side of the driver. The handle in the very front is used to level the pole or tongue. The curved handle which would be in front of the drivers face pulls the wheels forward to raise the tines completely off the ground for travel to and from the field.